We HAVE reached our goal !! Thank you so much for your help!! Today is the last day to raise funding for Trident!! Yesterday, Ronnie Graves, a prosthetic specialist --who owns and operates VIP -- Veterinary Inclusive Prosthetics & Orthotics-- was in Indiana to cast Trident's leg for his first brace. Ronnie was assisted by a local veterinarian and a student vet. All went very well ! We are SO close to our funding goal but need your help!!! 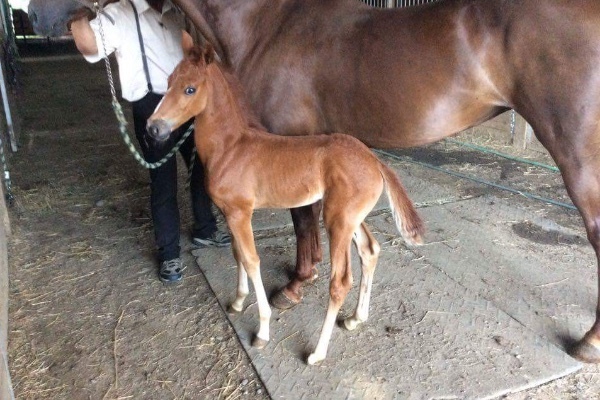 Trident, who was destined to be a work horse, is a 8 day old Morgan stallion that was born with a rare birth defect. He is missing his back left pastern, which makes him unable to walk without a balanced gait. The vet that saw him recommended that he be euthanized because he would eventually die due to the hardship of not being able to walk properly. This veterinarian is an old school, industry vet who works mainly with factory farmed animals and the use of prosthetics is unfamiliar to him -- large animals that have no use are often put down. The family that owned him was devastated, as he is completely healthy otherwise. They shared their story with a friend that was visiting and were thrilled to find out that their friend's sister, Dawnell Kilbourne who works at, "The Woodstock Farm Sanctuary" and there are animals who have been fitted with prosthetic limbs with great results. 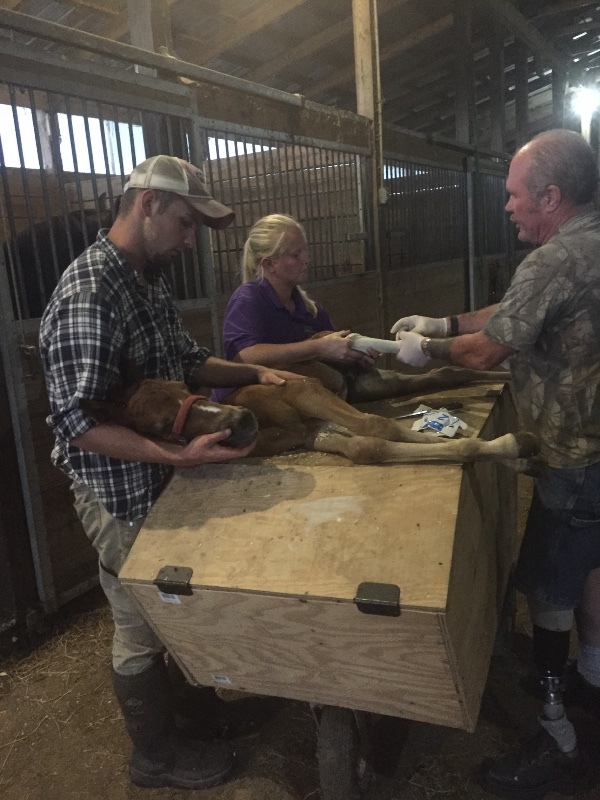 Pictures and videos were sent to Ronny Graves, the owner of VIP Veterinary Inclusive Prosthetics and Orthotics for opinions as to whether Trident would be a candidate for a prosthetic limb. The news came back that he would be a great candidate!!! We are so excited that Trident will have a chance at a life inside of a Sanctuary, that we are currenty searching for, where he can grow and be cared for and eventually be able to run with ease. Trident has a long road ahead of him, with the need to be fitted multiple times with new prosthetics as he grows. He is a spunky little guy who is a real fighter. Right now he is under the loving protection of his Mama, with whom he is well bonded too! We need to raise $2500 by July 14th-- this amount will cover everything needed for Trident's first prosthetic. Please know that Trudent is not suffering-- not horribly crippled with pain-- the vet who saw him was an old school, factory-farm industry veterinarian and has probably never even heard of prosthetics for animals. I have witnessed prosthetic use on animals for a number of years and they do work ! Tident is currently in Hagerstown, Indiana and will be relocated to a sanctuary as soon as he is weaned from his mother. He is NOT at a breeders----- his mother was bred and boarded with an Amish family to produce new buggy horse for them--- which I deplore horses being used for this and ALL carriage purposes!! We will post photos and video of Trident's casting and with his first prosthetic fitting. We have set a date for Ronny to come and do Trident's first casting! Thank you for the shares and donations! We have raised the money to cover the casting but are in need of the prosthetic cost. Ronny will be out around the 14th of July. Thank you!! Good luck with Trident - I wish all people cared about every animal.